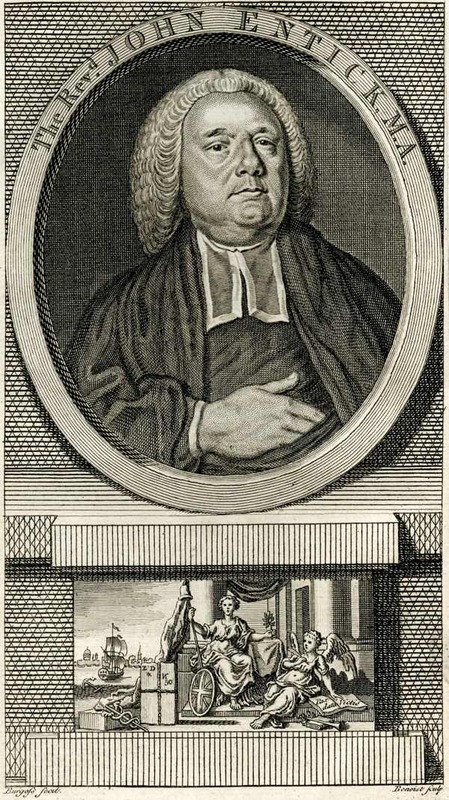 John Entick (c.1703 – 1773) had a reputation as an opportunistic hack writer who assumed the title of MA and the role of a cleric, by having a stern portrait engraved wearing a clerical wig, to promote a phoney scholarly impression. 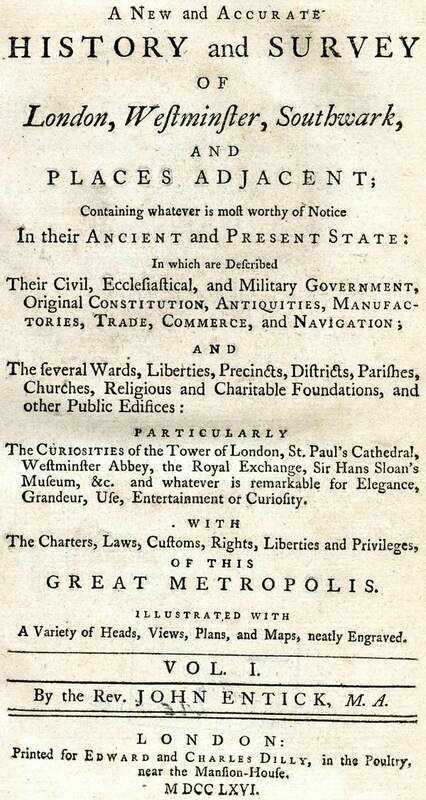 Yet his multi-volume ‘History & Survey of London’- from which I publish extracts below – based upon an earlier work by William Maitland, proves surprisingly revealing about Spitalfields. Produced a few decades after the construction of Christ Church, Entick describes the new parish of Spitalfields with many of the elements in place that we know today and even the long-gone Artillery ground may still be recognised by street names such as Gun St, Fort St and Artillery Lane. “Spitlefields was originally a hamlet belonging to the parish of St Dunstan, Stepney, but now it is a parish – made so by an Act of Parliament in 1723. In which year, the foundation of the church was laid and in 1729 it was finished, and dedicated to our Saviour, by the name Christ Church Spitlefields. This is one of fifty new churches, built of stone, with a very high steeple in which is a very fine ring of bells. It is a rectory endowed with one hundred and twenty-five pounds to be paid by the church wardens and the produce of three hundred pounds worth of land laid out. The vestry consists of those who have served or signed for overseers of the poor, and officers are two church wardens, twelve auditors of accounts, four overseers, one sidesman, one constable, one headborough, one surveyor of the highways, four scavengers, two surveyors of the streets and one ale conner. The parish enjoys the privilege of a market, which is of great reputation for all sorts of provisions. And there are no less than four French churches and a French Hospital in Grey Eagle St, and Quaker’s Meeting in Quaker’s St.
At the east side of Bishopsgate St, we come to Spittal Sq, and the site of the ancient priory and hospital of St Mary Spittal, founded in the year 1197 by Sir Walter Brune and Rossina his wife, for canons regular, and dedicated to the honour of Jesus Christ and his mother the blessed Virgin Mary. It was a foundation of very great extent, for in the composition made by the prior of this house with the rector of St Botolph’s, concerning tythes, it appears to have begun at Berward’s Lane, towards the south and to run as far as the parish of St Leonard, Shoreditch, to the north. And, in breadth, from the king’s street in the west, to the Bishop of London’s field called Lollorsworth, now Spitlefield, on the east. At its dissolution in the reign of Henry VIII, it was valued at four hundred and eighty pounds per annum and there were found in it one hundred and eighty beds standing for the relief of the poor, being a hospital of great relief. The site of this hospital is now covered with some of the best houses in this quarter of the metropolis and inhabited by manufacturers and merchants of great trade and worth, especially in the silk trade. But for many years there remained uncovered part of the churchyard and the pulpit cross in it. And on the south side there was a handsome house for the lord mayor, aldermen, sheriffs and people of distinction to sit and hear sermons preached upon the resurrection on Easter Monday, Tuesday and Wednesday (and perhaps on other occasions) by a bishop, a dean and a doctor of divinity, which custom was kept up until the year 1642, but in the grand rebellion the pulpit was broken down and the custom discontinued. To the south, facing the street leading from Moorfields, stands Devonshire Sq and the street that leads to it, stood upon the ground once called Fisher’s Folly, but better known by the name Devonshire House where the earl of Devonshire used to reside. The square and Devonshire St are well built and inhabited, but it is scarce possible to describe the mean and ruinous state and condition of the houses and inhabitants of the streets, alleys and courts on all sides of them. Nevertheless, here we find a Baptist meeting house and a Quaker’s meeting house, just without the east passage. About three hundred yards north east from this square lies a spacious enclosure, called the Artillery ground, let by the prior of St Mary Spittal to the gunners of the Tower, for thrice ninety-nine years for the use and practice of great and small artillery. And they came hither every Thursday to practice their large artillery, which moved His Majesty King Henry VIII to grant them a charter and the same was confirmed in 1584, and was established for the increasing of good gunners for the Royal Navy and forts. In both those characters, this ground being nominated and ordered to be set apart for those uses, the Artillery Ground became subject to the Tower. The streets built thereupon compose one of the Tower hamlets and the inhabitants summoned on juries belonging the courts held on Tower Hill. In the year 1585, the state and nation being threatened with an invasion from Spain, some brave and active citizens voluntarily exercised themselves, and trained up others in the use of arms, so that within two years there were almost three hundred merchants and other persons of distinction qualified to teach the common soldiers the management of their guns, pikes and halberts. They met every Thursday, each person by turn bearing office from the corporal to the captain, and some of those gentlemen were distinguished by the title of knights of the Artillery garden. yes, really interesting to read and informative about where names come from, like Brune House and Lolesworth House, Quaker Street and Tower Hamlets, and also about the Artillery ground. Wonder where his own name came from – the Netherlands? I smiled when I read your description of Rev Entick as an ‘opportunistic hack’. It makes me think of a modern day charlatan guides’ motto: “If you don’t know the answer to a question, make it up”. I didn’t know what a halberd was until I looked it up. In his novel/autobiography, ‘Sword of Honour’ E. Waugh has the main character Guy, as being in the Halberdiers. I like the frontispieces (pi?) of these old publications giving a kind of trailer of whats to come.